Divi is one of the most universal templates on the market. The portfolio version is very professional and fits almost any type of portfolio website. ElegantThemes team is putting that maximum effort into developing and supporting their themes and the outcome is truly amazing. Divi is their bestseller and it’s been used by thousands of web designers. You can’t go wrong with DIVI. You can choose different types of layouts, headers and integrate shopping options into your portfolio in couple of minutes and start selling your stuff straight away! How cool is that! If you want to create an eye-catching portfolio to showcase your stunning work, TheGem is your best option. It is designed to provide style, functionality and unmatched versatility to your portfolio site. This bestseller multipurpose theme is well suited for designers, illustrators, photographers, artists, and other creatives. It will help you to display and to promote your skills and services in the best way. Thanks to WooCommerce integration you will be able to sell your works online as well. 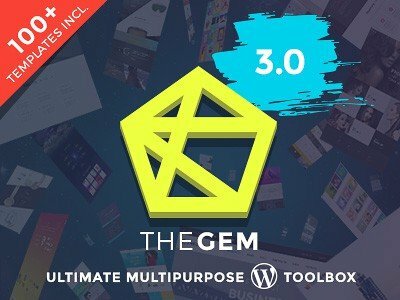 TheGem comes with over 40 unique breathtaking creative design concepts that will make your website stand out and capture the interest of your target audience. 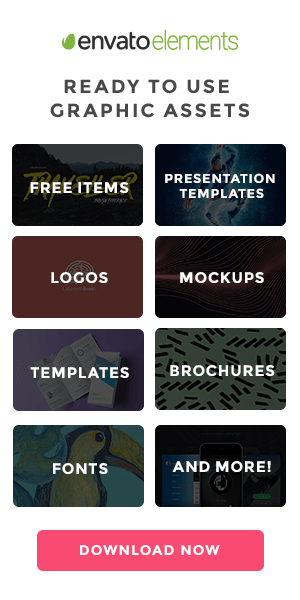 It delivers over 20 customizable amazing portfolio layouts with 15 brilliant pre-made portfolio item pages, which you can install in one click. There are literally endless ways to customize this theme to your needs. TheGem is retina ready and boasts ultra-high resolution graphics. It is entirely responsive and works well on tablets, smartphones, and desktop computers. This theme has a clean code base which is optimized for performance. Since TheGem is SEO optimized, you are guaranteed that your site will rank well on major search engines. It is completely possible to use a feature-rich multipurpose template to impress everyone with your online-portfolio. As you can understand, there are multiple niches that you can showcase on the web using this marvelous solution. For example, it is possible to introduce such topics as electronics, real estate, dances, education, cars, night club, environment, dances, and so on and so forth. Actually, your possibilities are unlimited. Photography and art are two more things that can be presented by means of this attention-grabbing template. Everything that you can dream about can be implemented in life. For the reason that amazing ready-made solution allows realizing even the wildest goals. Without a doubt, we should mention its super-light package. It weighs only 250 kb. This means two important things. Firstly, your pages will be loaded in a flash. Secondly, you can forget about having troubles in terms of website performance. It will work smoothly and quickly. When it comes to its design, everything becomes even more interesting. You will be able to choose from 500+ ready-made pages and pre-designed sections. They are capable of presenting all pieces of information your soul wants. In order to get access to them, you just need to press Magic Button. After this simple action, you can start discovering various pre-styled pages that will impress your imagination. Almost forgot to say that skins are updated on a weekly basis. One more thing that you will be happy to get is Elementor Page Builder. It will provide you with a user-friendly drag-and-drop functionality that will allow you to build your content in a code-free manner. You will also see all changes in a real-time mode. If you are good at taking photos or designing some projects but not coding, there is no need to worry. Even novices can get a tailor-made and impressive online-project without any efforts. The WordPress theme Brook exudes versatility in website creation, allowing users to emphasize creativity, performance, and variety on their sites. The plethora of customizable element-rich layouts for homepages, blogs, portfolios, headers, and footers, also bundled with premium WP plugins, promises every individual or business an edge in online branding and marketing. There are at least a dozen responsive layout available on each of these elements, making customization as streamlined as possible. More than 30 homepage layouts are included and multi-area, which enable the Brook theme to service niches and businesses of any size, such as creative and digital agencies, business, design firms, engineering and architecture, and for solo entrepreneurs, SMEs, freelancers, and more. Home pages on this theme are also streamlined for creativity and user experience. Whether your website calls for a single-page homepage, compatibility with a landing page app, an ecommerce shop, or a showcase of products, services, and portfolios, the available layouts should take your website to a different level. It only takes a single click to import demo layouts, and with minimal coding necessary, users can start building impressive and professional websites to their heart’s desire. The theme also includes custom shortcodes for widgets and other elements, plus an infinite color option to help build a unique website as they can imagine. Creativity should be effortless with this theme’s drag-and-drop WPBakery Page Builder (valued at $45), which provides a simpler approach to creating stunning websites. The theme also includes the WPBakery Page Builder Clipboard (valued at $17) that lets users cut, copy, and paste media elements without toggling off the main page builder, hence the website creation becomes even more seamless. For added aspiration and visual design, Brook also includes the premium Slider Revolution plugin to allow users to showcase more images and visual content (valued at $25). To top it all off, the theme comes with Font Awesome Pro fonts to maximize customization and branding. In terms of sales, Brook allows users to maximize ecommerce on their websites. Two layouts are available using the WooCommerce plugin – via an online shop and product landing pages. So whether your business needs showcasing featured products, discount offers, sales and countdowns, or an impressive showcase of new and hot products to buy, this WordPress theme has you covered. Search Engine Optimization (SEO) with this theme is also made as easy as possible, especially with the SEO by Yoast plugin. With minimal knowledge and the right keywords, your website can enjoy better ranking and online visibility, which can be optimized with just a few clicks. Brook also allows the user to showcase content via Infinite Scrolling, which reduces the amount of used memory and capacity while still maintaining your website’s ranking when crawled by search engines. The theme is also retina-ready which optimizes and refines images to meet the demands of Retina display, hence a better viewing experience. Brook also features a child theme, which exhibits the same functions as the parent theme while serving as a backup for files and settings already made. And if you need further assistance, it will be good to know that lifetime support will be available upon purchase. Brook is definitely worth every penny spent. Signature is the masterpiece coming from the Designova team. It’s a portfolio theme with more than 26 unique demo variants. It’s the perfect website theme for creatives, business corporations, musicians, artists, freelancers, photographers, DJs, illustrators, stage professionals, actors, e-commerce stores and anything else you can imagine. It allows you to play around and completely customize the theme to your unique needs. Personalization at its finest. Drag and drop components, edit the demo presets, mix it all up and combine every little detail to create your own brand new unique web design that your customers will fall in love with. Godlike creative freedom will make you fall in love with this theme as there are more than 100 unique Visual composer shortcode elements, 300+ Web Pages in total, W3 valid and perfectly hand-coded. Choose from 26 unique header & footer styles. There is more than 100$ worth of plugins and add-ons when you buy this theme. Its WooComerce compatible so it is perfect if you are planning to run an online store. Enhance your text with premium & modern UI fonts that are included in the package. Its compatible with all the current standards and of course mobile friendly. For easier understanding, there are also step by step tutorials that take you through each element so you know how to use it in the most useful and efficient way. What else could you wish for? Get your Signature WordPress theme pack from Designova now and never look back again! Weston is a modern, elegant and sleek multi-concept theme that can be used for most types of business activities. Thanks to its compatibility with so many important WordPress plugins it can be transformed to anything you want or ever wanted. Even the code can be modified to your needs but in this case there is a coding knowledge obligatory. Otherwise building a website with Weston require no previous coding experience at all as everything is drag and drop and visual. Weston is fully responsive and makes great impression on any screen size. Start with one-click-demo-import feature to import all the beautiful predefined layouts so you can start your customizing journey. Check all the hover and parallax effects, set video background, filtering animations, ajax loading, select the right font (Google fonts, built in fonts), choose the right color combinations, play with the header flexibility, built widgets and sidebars and add and style Google map and contact form. If your website has many pages and sub-pages it is recommended to use the power of Mega Menu feature. In case you want to turn your website to an online business – to a selling online shop you can count on Weston. Its compatibility with Woocommerce is priceless and setting up an online store is a question of few hours. Choose the layout you like, load pictures of your goods, insert some nice and catchy text, set up payment method and start selling. Easy life. Weston’s WPML compatibility is making it easier to translate the website to different languages. Theme comes with 1 year of support and updates that can be renewed if you do not want to renew the updates and support you simply don’t pay and continue using the theme for free. Oriana is a minimalist template designed for photographers. We can seriously claim that it is designed in the most marvelous way ever. There are a few main reasons to grab this high-quality solution. This wonderful ready-made template can also capture the attention of the target audience. It has a fully responsive design. Your potential clients and employees will like the way how the appearance of your online-project is rendered on all devices. This means that it will be simple for them to get familiar with your content (including all works, services, and their benefits) using both laptops and smartphones. Believe us, its design is not going to shift their attention away from your talented works. If you are experienced in taking eye-catching photos but not building online-portfolios, there is no need to worry. This fully-fledged template can be installed just in one click. In addition to this, it is completely simple to be customized thanks to great drag-and-drop functionality. You can configure various website aspects and work with colors, fonts, and so on and so forth. As you can understand, there are unlimited color presets and lots of Google Fonts to choose from. Without a doubt, you want your audience to grow bigger and bigger every single day. In this case, you can think of translating your online-project into several languages. If someone becomes interested in some additional information, he or she will be able to ask all the necessary questions. It will happen thanks to a user-friendly contact form. If you decide to create your creative online-project on the base of this amazing template, it will certainly turn out to be an extremely valuable asset. Actually, this first-class solution was created for those who want to showcase his or her art gallery on the Internet. Thanks to it, lots of masterpieces will become visible to different fans of art and everything connected with it. There are many eye-catching pages that are included in its package. Among them, you can find an excellent homepage, about, services, gallery, and clients pages. Each of them is capable of getting the recognition you have always dreamt about. In order to create your content in a codeless way, you need to take advantage of the fully-functional Elementor Page Builder. It has an intuitive drag-and-drop functionality that allows building well-designed websites. Even if you are not familiar with coding. Even if you decide to start creating your online-presentation for the first time. Furthermore, it has a mobile-first design that makes it possible for people to use different devices to get familiar with your pieces of information. There are also various header, footer, and blog styles that are crafted in order to make an appearance of your website look original. You will also get an ultimate package of Cherry Plugins that will engage your potential readers and bring new guests to your art gallery. Do not forget to take advantage of impressive bonus images that are considered to be suitable for different topics connected with art. Oshine is Creative, Responsive Multipurpose Portfolio WordPress theme that comes with 18 stunning demos to help you create a beautiful, modern & clean website. It is packed with features and has more portfolio styles and options than any other theme. You can create unlimited metro style grid of your portfolios and choose between 8 different in-built single portfolio pages. The Horizontal Carousel slider showcased in v2 demo is huge hit among photographers. The theme also has a cool grayscale hover effect for your thumbnails and its lightbox functionality is slick. The theme works great in mobile devices & tablets. The theme is easy to setup and has a one click demo import option. The theme comes with a powerful visual page builder that has over 50 shortcode styling modules built into it. The theme also has automatic one click updates, so that you can stay up-to-date and from what we have seen the theme is updated quite frequently. The theme has over 3000 customers and an average 5 star rating, which is quite impressive. No wonder it has been been one of the best selling portfolio themes of 2017. Kalium is very modern portfolio wordpress theme for creative professionals. It’s best for showcasing of your work and ideal for photographers, designers, graphic designers, artists, illustrators, etc. It has become very popular on themeforest and it reached more than 600 users. Kalium has been awarded on AWWWARDs, CSS Reeel and CSS design awards as well. Template is under continuous development and eshop implementation is coming soon! There are couple of premium features included, such as, revolution slider, visual composer, layer slider, etc. Kalium is full of other options and features and it’s literally endless to list them. You should jump on live demo and checkout by yourself. If you like the preview picture you won’t be disappointed for sure. Throne is beautiful and clean WP portfolio theme ideal for freelancers, graphic designers, photographers, copywriters, book sellers, designers, architects, etc. Theme comes with bunch of pre-designed homepages, sub-pages, menu styles, different menus, project layouts, project grids, blog post styles etc. All of these can be imported with demo data. By using this option, you will save plenty of time. Template comes with 3 major plugins. With revolution slider you can create great looking slideshows with effects and impress your visitors. Visual composer plugin is amazing tool for building layouts or customizing pre-designed layouts. Woocommerce doesn’t need to be introduced. It’s the most popular WordPress ecommere platform running under WP. It includes everything you need for your eshop. What else? Throne is fully responsive, mobile friendly and fast loading. All these three factors are super important for SEO. What else? Theme is for all types of user with any experience. You can get everything done without touching a code. Just follow documentation, update regularly and talk to support. You’re 1 step from having your portfolio. Go for it. Center is a clean WordPress theme that is created for photographers, designers, illustrators, fashion bloggers, and other creative folks who want to promote their works, articles or news. The theme combines elegant grid style layout with a bold typography. Also, it fully integrates with your social media channels. The Center theme is responsive, SEO friendly and cross browser compatible. It’s fully customizable and easy to use; an intuitive Theme Options panel lets you edit every aspect of your website. Other features include unlimited usage, free support and updates, custom colors, custom Google Fonts, etc. It should be also mentioned that Center is easy to navigate thanks to a fixed navigation menu; when clicked, the hamburger button reveals the pages you can have on your website (Home, About, Portfolio, Blog, Contact). Now let’s take a look at the right sidebar of this creative WordPress theme. Here you can display your Instagram photos, a Meta Slider, and a few sections including About Us, Recent Posts and Categories. If you want to know more about the Center WordPress theme, visit the live demo or check a quick video tutorial that is available on the official theme page. Maybe the best thing about Center from dessign.net is that it’s suitable for every type of website, from personal blogs to portfolio sites or corporate sites. Modern, sleek and minimal design combined with versatility and creativity. That’s OAK, creative, portfolio WordPress theme. Whether you run a creative agency, business studio, architecture or real estate office, whether you are an artist, photographer or a blogger OAK has your back. Built on a quality framework Bootstrap 3 and with valid HTML5 / CSS3 code it offers a solid base for any of your projects. Easy to modify final look with no previous coding experience. Building and creating process is all about drag & drop system. Import cool demos change fonts, colors, pictures and text and you are almost done. Get a website up and running in few hours. OAK has fully responsive design and it is ready to be loaded on high definition Retina displays so your images will look even more stunning than usually. If you are planning to translate the website to another language OAK supports WPML plugin so feel free to add as many languages as you need. Apart from WPML, OAK supports almost all of the most important plugins in WordPress world such as Contact Form 7, Mail Chimp, Yoast by SEO, W3 Total Cache and many more. OAK comes with option of hundreds of Google fonts as well as four types of icon fonts Stroke 7 Icon Font Set, Ico Moon free Pack, ET Line and ION Icons with total number of Icon Fonts over 1000. Theme comes well documented and with fast and supportive dedicated help team. Beoreo is multipurpose wp theme which is ideal for creating portfolio websites for freelancers, artists, graphic designers, fashion designers, photographer etc. Theme comes with 18+ different pre-designed variants and some of them are focused on portfolio showcase (for example the example from above). Design is very minimal, creative and meets all the current trends in web design. All the pre-designed version can be loaded just by 1 click and customized easily with visual composer. No need for coding skills, just follow documentation or get in touch with support team. It will save you plenty of time. Theme comes with bunch of creative features ready for your portfolio, such as, revolution slider, team carousel, blog grid, pricing tables, skills box section, social media widget etc. By putting together and showcasing your best (most reputable) work you can attract new visitors easily and turn them into clients before even talking to them. Make sure you follow some rules of successful portfolio websites in order to strategize better your website. Small details can make a huge difference and bring you much better results, when it comes to conversion and getting more clients. Online reputation is important for every entrepreneur, freelancer or agency. Thanks to WordPress and professional premium portfolio themes you can achieve that in just couple of days. Visit Beoreo live version and test it out by yourself. Mix portfolio WordPress theme is one of the most popular from dessing.net marketplace which comes with tones of themes which are ideal for creating portfolio website of individual or agency! You can get actually 130+ themes for only 99USD. That’s definitely one of the best deals you can find these days. Their products are very simple and professional with focus on conversion and improving your business revenue. Make sure you check their website and give a chance to other themes as well. Mix is only of the many but it’s definitely what you’re looking for your portfolio. I recommend visiting live demo on you phone & laptop to see responsiveness, other features and user experience. It comes with everything you need for your website, such as, SEO optimization, slider options, menu options, footer options, installation, documentation, lifetime updates and customer support. Cooper personal WP theme is idem for creating of trustable and transparent portfolio website. You can easily show off your skills, experience and work. Template comes with pre-designed demos for portfolio and eshops as well. You can easily turn your website into ecommerce as well and start selling your products. Theme is full of other pre-designed elements and sub-pages which will save you plenty of time. For example you can choose from 4 different portfolio styles, 4 post formats, 6 portfolio item pages, 3 shop pages, 2 product pages and 5 blog pages. Using and combining these styles will save you plenty of work and time. Theme is fully optimized for mobile phones, tablets or laptops. You really need that nowadays. Make sure how your website looks on the mobile device. What else? Theme doesn’t only come with support & documentation! Author will provide you with detailed video tutorial which will guide you through every step of installation and getting your portfolio website done. Feel free to get in touch with them submit your pre-sale question or preview live demo on their website. Cooper in an amazing theme which allows you to create professional portfolio, build trust and turn your visitors into clients interested in your produts or services. It has a lot of personal touch and that’s a key when it comes to customer’s decision making. Werkstatt is a portfolio WP theme for creative souls. It has been developed with attention to detail in mind and therefore the result is surprisingly smooth theme. With Werkstatt one can present anything with various portfolio options. More than 20 one-click importable demos are ready to serve as a template for your ideas while they can be fully customized with Visual Composer and changed in live preview mode. It is only up to your fantasy what are you going to create. With Visual Composer everything is drag & drop and everything is easy and smooth. If it comes to portfolio show off, theme has tons of options and tens of prepared styles (more than any other theme on ThemeForest). The same is with blogging. Included are 7 blog styles and 3 different pagination options which is enough to stand out of crowd. Another refreshing feature is the option of setting some sound effects such as background music, click, hover or menu animations. The template comes with tons of font types and icons available straight away when you need them. The theme is ready for HD Retina screens, it is responsive and it looks great on any screen size. Apart of great design it is fast and ready to achieve great Google ranking results by following all the latest recommendations and general rules of Search Engine Optimization. WPML integration makes it easy to transform the website into a multi-lingual one. With the purchase you get an access to extensive documentation and an attention of a 5 star dedicated support team. Werkstatt is a good theme for good money. It is a good deal. Higgs is creative WordPress theme ideal fro different types of portfolios! It fits best the creative agencies or freelancers with need for professional / minimalistic showcase of the work. You can choose from bunch of pre-designed homepages and subpages which can all be easily imported just by 1 click from demo data content. There are different types of trendy portfolios available as well, such as, metro, grid, packery and masonry. Everything can be easily customized and adjusted for you personal (agency) needs with visual composer. It’s one of the best tools (WP plugins) on the market which make the whole process smarter, faster and suitable for any type of skilled “web designer”. You can get everything done with zero experience just by dragging & dropping elements into different sections of your layout. Visual composer is premium plugin which comes also with revolution slider and advanced google maps plugins for FREE within the template. You will save up to 72USD. Higgs scores very well for speed tests and that’s a great advantage when it comes to ranking in popular search engines. Make sure you visit live preview and test everything by yourself in order to get proper user experience before you decide to use any theme for your portfolio website. Hempstead is stunning portfolio WordPress theme with very unique design! Definitely one of the bestsellers on themeforest. Great grid layout is optimized for mobile / tablet touch and swipe. It come in 3 different demos and creative concepts. Very elegant design suits different types of portfolios, such as, freelancers, agencies, illustrators, graphic designers etc. Hempstead is very friendly and easy to set up. Template includes professional blog, SEO optimization, great documentations and support etc. Great deal for couple of bucks. Maya is a powerful tool not only for creatives but for everyone who wants to make something different. Something personal, colorful, with great fonts, stunning video or paralax background. Make it your story, make it your dream come true, make it as soon as possible, make it with Maya. Whether you are after a blog to share your ideas or memories, or you desire to present your work, or you have a client who wish an outstanding on-line shop you can make it all with Maya. The list of usage seems like with no end. With 100+ ready to use layouts it has never been easier to make an extraordinary result. A website where visitor would feel comfortable and therefore would spend longer time (and decrease the bounce rate). But it is much more than these 100+ layouts. It’s variety of menu options, header and footer settings, shortcode support, 9 packages of icons, all google fonts, 100% SEO friendly, loading speed optimized, fully compatible with eCommerce standards, responsive and Retina ready, translation ready, even for right to left languages. Theme is incredibly versatile tool for any project. It comes with premium plugins included so you do not have to pay extra $100 or so. Visual composer ($34), revolution slider ($19), the grid ($25), google maps for visual composer ($19) and few more. With Maya theme you wont have problems and if you always contact professional and dedicated support team, check the extensively written, detailed online documentation and plus you get lifetime updates. It’s a good deal for reasonable amount of money. Build smart, build with Maya. Dani is a great modern theme with a simple but fully functional design. If you were thinking about a great and interesting template suitable for portfolio showcase or online shop don’t look more. With Dani, a storming WordPress Theme, it is possible to create a stunning website for a short period of time with no previous coding experience. Dani suits all kinds of websites but it looks the best as a showcase. So whatever you need to present or sell, Dani is here to help you. Dani has been written in clean and well organized code allowing anyone to make modifications. The template is responsive and retina ready. It fits screens of all types and sizes but the best outcome is on crystal clear retina displays. Dani comes with handful of premade homepage demos that makes the creating process even more easier and smoother. Start with importing the default content and than do the customizations. Change the background to a video, add music, set up a header and menu options, create a unique contact form, choose the right font for your project, find the best color combination. Take the advantage of Google Map support and make the Contact page more appealing. Use all these features to create a unique and super positive user experience. The customization combinations are endless. With the purchase you not only get a great theme but access to a premium and extended online documentation with code examples. If you still have a question or an issue you are not able to solve with documentation you can submit a ticket to a dedicated support team. Malmo is a great portfolio theme that impresses with minimalistic design, very balanced and modern look. Easy to work with and pleasure to browse the final website. Its multi-conceptnes fits mostly e-shops, portfolios and blogs. 18 prepared home-pages are ready to be used within few clicks. Malmo is a celebration of charm, usefulness and satisfaction. With no previous coding experience, with Malmo anyone is able to built something good looking. Use vast customization options. Use variety of shortcodes, paralax effects, animated sliders, change typography, video background, google maps, search feature and much more. Malmo comes with the best selling drag & drop plugin in the world, visual composer and well known slider builder slider revolution. Both plugins are premium class and the total value of them is over 50 dollars. Import all the demo content in one click. How easy. Setup blog layout, portfolio layout and gallery layout. Make it different, make it yours. Each successful site need a touch of originality otherwise it is just another copy among millions. Just another brick in the wall. Just another fish in the sea. With the WooCommerce integration option it has never been easier to turn ordinary website to a selling machinery. Pick a layout you love, import pictures, add description, set the price and you are good to go. Start selling goods, start a business you always wanted. Start by this weekend. The theme is fully responsive and ready to be displayed on high resolution retina screens. Malmo can be translated to any language you and your business need. Check out some of the most creative portfolios for inspiration. Another great WP portfolio theme from web-dorado.com marketplace which is offering their products and services for very reasonable price! They have bunch of themes and plugins ready to be used for your online projects. With this theme you can display best of your work and attract your new customers. It’s 100% responsive and you can easily crawl portfolio on any type of internet browser running on any device. Everything can be managed and set in back-end of your wordpress installation. No coding skills are required for creating / customizing or updating of your website showcase. Template comes with video support, customer chat, regular updates and detailed step-by-step documentation. There is bunch of different CSS effects and the best way is to check them out in live preview version. Author offers great plugins for FREE, such as, zoom, spider video player, form maker, calendar, catalog etc. Make sure you visit items page for more details. Deca is universal portfolio wordpress theme ready to rock your website! It’s been out there on themeforest only for few days so far but it has huge potential for sure. It’s made by one of the elite authors called unCommons. It comes with tons of pre-designed elements, such as, 4+ galleries, 3+ portfolios, 2 blog pages, 10+ homepages and 5 different headers. With all those you can create hundreds different websites for various projects! If you take a look on portfolio you can see links to all different types of websites, such as, portfolio, agency or product promotion. They are all very modern & trendy looking designs on PRO level. What else? Deca is fully compatible with woocommerce and that allows you to run eshop within all the websites included in Deca template. You can switch very easily add prices, setup shopping cart, checkout etc. Deca comes with bunch of other useful features, such as, one page & multi page, visual composer, bootstrap 3x, mega google maps, parallax backgrounds, WMPL, SEO optimization and much more… On the other side, template is very easy to setup and you don’t need any coding skills, just to follow your documentation or contact authors team if you end up lost while getting your portfolio website done! HyperX is another popular WP theme for portfolio websites of freelancers or agencies. You can showcase your creative work, team, experience, products and everything related to your business. Theme is fully compatible with woocommerce plugin which allows you to add all ecommerce features needed for online ecommerce store. HyperX is great solution for beginners with WordPress or Web Design in general. It’s super simple and plus it comes with detailed documentation, 1 click demo import and dedicated support team of developers. With included premium visual composer you can build you layout easier than ever, you just set columns, rows and drag & drop different website elements inside. VC plugin comes for free with premium addons and revolution slider as well. Those plugins can save you up to 70USD.For creating portfolio page itself, there is bunch of different options, such as, masonry, metro or fitrows layouts, custom thumbnail ratios, testimonials, 20+ hover effects, lightbox image/ video popup, image overlays, post format icons and tons of other options for single portfolio product page. There are also different variants for posts, galleries, filters, menus, sidebars, backgrounds, comments etc. The complete list would be never ending. Therefore, I recommend you to visit item page + live demo in order to get complete overview and see how huge is this product! Soho is professional solution for your portfolio website! With this WordPress portfolio theme you can achieve amazing outcomes, in terms of conversions or reputation as a creative individual (freelancer) or agency. Soho comes pre-designed in 6 main versions, such as, justified photo grid, showcase list, carousel slider, mixed portfolio, masonry portfolio and trendy curtain slider version. All of those has unique approach and you will definitely hesitate when comes to decision which one to go with. They are all truly awesome and I recommend to visit live preview and experience them by yourself. All demos can be easily imported after theme installation, no coding skills required. Everything can be simple done by few clicks, and customization is user friendly as well. Soho comes with bunch of awesome tech features, such as, visual composer plugin, shortcode generator, advanced typo, valid HTML5 / CSS3, page transitions, 100% mobile friendly, multilingual ready, social sharing integrations, etc. You don’t need extra skills to get your portfolio webpage done, just follow detailed documentation and video tutorials. In case of bigger issues contact support forum, author is offering premium 5* support of their products. You can also submit pre-sale questions, in order to find out if everything will fit or your upcoming showcase project. There is always a chance you bring new idea for next update and you’ll get what you want! Heli is multipurpose / portfolio WordPress theme ideal for individuals, agencies or creative companies. You can choose from bunch of pre-designed demo versions which are ready to be used, you just need to import demo data. It only takes one click! Heli has been rocking on themeforest in last few days thanks to fabulous design and great functionality. It meets all the important trends in every aspect. Author of the theme tries to bring great improvements in updates and offer high quality support. Heli is high performing theme with 92% page speed score and 95% YSlow score. These are important factors when comes to ranking in search engines. Heli is easy to use template and for setting your portfolio you don’t need any coding or designing skills. Everything can be easily done by visual composer. Simply create layout columns, rows and drag & drop website elements. There are three other premium plugins included for FREE in theme package. Revolution slider, essential grid, VC and VC addons will save you 91 USD. Heli comes also with professional writing options which allows to run blog on you website and show off other sides of your business. You can choose from different blog and blog post layouts. There are tons of other features which you will definitely find handy when it comes to your portfolio or other type of website. Make sure you visit theme’s detail page and go through the whole list of features and functions in order to make sure Heli comes with everything you can possibly need for your portfolio showcase. Don’t forget to check live preview as well and go through all the demos. They are truly amazing and TOP on the market these days. Dorian is multi-concept theme which can fit bunch of different portfolios for creatives, such as, writers, artists, bloggers, designers, graphic designers, photographers etc. It comes with 21 pre-designed homepage variations which all look creative and very professional. All of them are included in demo data which you can import just by 1 click right after your theme installation. Demo data is huge help and saves you plenty of time. After import you can just edit elements, columns, rows, layouts and add your own content and photos. Thanks to visual composer the process is very simple and you don’t need any coding skills to setup your portfolio website. With Dorian you can also extend your portfolio with ecommerce features and run fully functional eshop. Everything is smooth thanks to woocommerce plugin which TOP solution for creating online stores in wordpress. There are also 5 beautiful blog layouts and blog post layouts which can take your blogging to whole different level. Your writing will stand out of crowd. What else? Dorian comes with bunch of other features ready for your portfolio, such as, icon packs, powerful typography, social integration, SEO optimization, creative shortcodes, revolution slider, WPML optimization and much more. Feel free to jump on item’s page and have detailed look on all features, it’s pretty packed! Don’t forget to check out live demos as well in order to understand user experience and quality of the theme. Overlap is high performance wp portfolio theme suitable for agencies or freelancers working in art, photography, design, web design and other creative fields. It comes with very unique layouts which are pre-designed and can be loaded very easily by importing demo content after your theme installation, it takes only 1 lick. All of the mentioned layouts were created in visual composer which is part of the theme package. Therefore, you can easily customize them and add your own colors, pictures and text. There are bunch of different showcase options and you should definitely check out live demo to see potential of Overlap theme. Having trendy & unique portfolio website is essential when it comes to user experience nowadays. Overlap comes with bunch of other features, such as, woocommerce integration, 500+ google fonts, one page version, ajax page transitions, parallax effects. Author of the theme is offering 5 star support which can come very handy when you get stacked with your WordPress website. There are also other pre-designed elements of website, such as, 4 different portfolio version, 4 different list layouts, 4 blog post layouts, 3 blog page layouts, multiply title areas, multiply webpage sections, various navigation options and unlimited footer variations. If you are looking for complex portfolio solution with not only portfolio showcase, you will definitely find this theme suitable. Apart from what I’ve mentioned so far, there are other interesting features which are listed on themeforest full item page. Don’t hesitate and check it out. Peekskill is another wordpress theme for creating portfolio website with very professional approach! Theme is super clean and focuses on product / service showcase. It’s been released and supported by one of the elite authors called tommusrhodus. Their team has 4+ years experience with creating wordpress themes and supporting their products. Peekskills has super simple design and to orient on the website and control it is very smooth. Every element on the website, reach really fast. It’s ideal for different types of portfolios, such as, photographer, designer, artist, illustrator, fashion, etc. Theme is very easy to use and if you have decent PC skills, you can get your portfolio done without any help. Just follow attached step-by-step documentation and make sure you contact support forum when it comes to bigger issue. Peekskils is packed with bunch of awesome features, such as, CSS3 animations, 1 click demo import, filterable portfolio, visual composer, project detail pages, video pages, slideshow pages, valid css3 & html5, gallery, etc. Blog layout is also designed nicely and your followers will definitely enjoy content. Having blog and personalize your website is always essential when it comes to individual’s portfolio. About page is pre-designed and should be on your page for sure! Theme is fully responsive also and loads on every single device with internet browser. Check out live demo and more details, just click the button above and it will direct you to the author’s portfolio. Furion is creative wp theme for building outstanding portfolio or creating blogging website. It comes with 4 different pre-designed homepages which give you enough inspiration to create an amazing website out of Furion theme. You can easily load pre-designed demos via data import after you install your theme. Furion is ideal solution for agencies, freelancers, designers, photographers and other creative people or organisations. Theme is fully responsive and ready for any browser and browsing device! Feel free to test it out on your mobile phone, it looks really cool! What else? There are bunch of features which I should definitely mention, such as, visual composer, revolution slider, advanced custom fields, google fonts & awesome icon pack, built-in SEO, etc. Furion comes with PRO customer support and regular theme updates. There is also detailed documentation which will guide you throughout the whole process of installation and customization. 3 of the plugins included in package are premium and together you’re going to save $70 on it. How cool is that, right? Make sure you visit live demo before you purchase the theme. Feel free to open up conversation with author before as well in order to make sure that theme will meet all your requirements. Keep your portfolio up to date with your best / newest work and content will your social media channels. Check out 7 rules to creating portfolio website in order to get great overview on what to keep in mind while customizing your theme. Showcase is very unique solution for portfolio website! You can create very interactive slides and present your products and services in an outstanding way. All the slides versions are fully responsive and mobile friendly. You can choose from 100 fullscreen slide transitions, 3D animations, screen layouts and create amazing online presence for your business. There are also bunch of different web layouts to choose from and creative variations for headers and menus. You can combine then into very impressive portfolio website! With showcase theme you can go really creative and impress your visitors very easily, make sure you visit all live demos to get enough inspiration. There are all pre-designed and super easy to import, it will save you plenty of time. Theme comes with bunch of other amazing features, such as, woocommerce integration, portfolio shortcodes, translations, page builder, full / boxed layouts, wordpress customizer, grid portfolio layouts, child theme, cost calculators etc. What else? Theme comes with all premium features, such as, detailed (step-by-step) documentation, regular FREE updates and professional customers support. Feel free to contact developers with any pre-sale question as well. Showcase is an amazing theme you can create really PRO portfolio website which will sell out your business online. Parallax One is another portfolio wordpress theme with amazing one page design! You can showcase every aspect of your company or agency in one page. Show off about page, products / services, contact page, clients testimonials and much more. Having a clean showcase and portfolio online is definitely great choice and your visitors will stick with your brand! It’s definitely essential factor when building a trust online. If you keep your website messy, you won’t see got conversion for sure. Parallax One comes with very clean and valid code which is great for search engines while ranking your content. It’ll save you a lot of time while getting your on-page SEO done! Template also comes with great documentation which will be very helpful in the beginning, especially when you don’t have much experience with wordpress platform. There is also premium support available! In case you need help with something, feel free to contact theme isla and submit your ticket. Check out live demo if it’s what you’re looking for your portfolio. Meet very creative portfolio wp theme called stag! It’s coming with very simple design and bunch of pre-designed demo layouts. You can choose from different portfolio showcases ideal for freelancers or agencies. All portfolio are interactive and comes with unique effects! You can save up to $65 with included theme package plugins. Visual composer, slider revolution, templatera addon come for FREE + 21 elements for visual composer build exclusively for STAG by author! Having visual composer in your theme is an amazing advantage! To build up layout and get the content ready is super easy. No need for coding skills! What else? Stag come with bunch of essential features, such as, WPML translations, advanced typography, versatile header, social media integration, SEO optimization, on-scroll animated content, free google fonts, RTL support, child theme and so on. Stag has been rocking on themeforest in its first 2 weeks and that’s proof of high quality. Theme comes with professional customer support, detailed documentation and regular updates. It’s fully mobile friendly and you can load it on any type of web browsing device. I definitely recommend to visit live demo to check it out and experience everything. Make sure you check some modern portfolio trends in order to make your website successful and achieve great results. Grand portfolio is another professional theme from Themegoods team! They released bunch of amazing portfolio themes recently and you can definitely find the one, for you. Themegoods is one of the 10 TOP best sellers on themeforest and you can be 100% sure about quality of the service they provide. Grand theme comes with 8 different types of pre-designed portfolios which will definitely meet your requirements. You can choose from creative design agency, blogger, photographer, musician, architect, fashion designer, magazine or agency portfolio version. All demos can be easily imported from demo data content with just 1 click. After that you can easily edit them in content builder. It’s very easy to use, just drag & drop & edit sections. Grand comes also with bunch of different layout options which can be easily setup! You should definitely consider using them. Theme is fully responsive, mobile friendly and optimized for all types of web browsers. Grand theme comes with tons of features, let me list the most useful ones, such as, wordpress customizer, 70+ pre-designed subpages, infinite scroll, image lightbox, woocommerce integration, mega menu support, SEO optimization, instant AJAX search, off-canvas menu, parallax effect and much more. There are also 2 premium plugins included! Revolution slider and ilightbox will save you $34. Themegoods has been offering their support services for really long time and become truly one of the best. When it comes to issues or anything you can’t figure out in your theme admin, feel FREE to contact them. Make sure you follow their step by step documentation and might end up getting your website done without asking for support! Alpha is the most unique portfolio theme I’ve seen in 2017 so far! It comes with amazing scrolling feature which is definitely something new on themeforest. It’s custom build unique slider which present your creative work in outstanding way. Don’t hesitate and check out live demo to understand what I’m talking about here. Theme comes with cool page builder as well which is the most popular out there. Visual composer will do most of the work for you, you just need to setup layout and drag & drop elements. No coding skills needed. Alpha theme is super fast and loads smoothly on any device. It’s very important fact for SEO purposes, plus your visitors will definitely appreciate as well. Alpha is product of KrownThemes team which offers amazing documentation and support to their products. You can’t go wrong with themeforest elite author. What else? Alpha comes with bunch of other features, such as, 100% responsivity, modular grid, translations ready, valid html5 code, creative blog style, unlimited portfolios, interactive contact maps. You can use theme for different types of portfolios, such as, creative agency, freelancer, artist, web designer, photographer or any other creative person. Alpha is an amazing combination of creative design and functionality. You can’t be wrong if you put ajax integration, unique slider, animations and fast loading into the one website. You visitors will love your website and they’ll have remarkable experience once they visit your website. Another portfolio theme for creative designer, photographer, freelancer, artists developer or any other creative individuals but also the agency. Theme comes with buatifully clean layout and design which will help your work to stand out. It’s fully responsive, mobile friendly and compatible with all major web browsers, such as, firefox, chrome, safari etc. Everything is based on powerful bootstrap 3.x grid framework. You can be sure about the quality of code! Theme comes with other creative features ready for your portfolio website, such as, post formats, clean SEO code, 2 blog styles, social media widgets, lightbox gallery, video support, pre-designed subpages, contact forms etc. You can find links to all resources used in the theme in case you would like to use some of them as well. Creative Market is marketplace where you can find it for sale! It’s been featured there for couple of months as one of the best portfolio themes. Make sure you visit live demo and try everything by yourself. Getting your portfolio done on your own domain has never been easier. Don’t hesitate and show off your work through moder portfolio website which will stand out of crowd. Widescreen is another theme by AITthemes.club in our collection. Definitely great tool for those who are looking for professional solution for creating online portfolio. Theme can fit needs of various businesses, such as, photography, design, artist, web design agency or ecommerce store. Yes, you can also run ecommerce on your website thanks to woocommerce plugin compatibility. All essential features for shop, such as, cart, checkout, shipping, product pages and so on, are included. Full responsivity allows your website to be mobile friendly and easily loaded by any web browser out there. One of the biggest advantages which AIT team brings to the market are definitely their multilingual admin options. Admin of all of their themes is translated to 18 different languages. Definitely something you love when it comes to giving finished website project to non english speaking client. Widescreen comes with 3 different homepage variants. They look creative and professional and once you get demo data imported, you can set them up very easily. Theme supports different types of medias for you portfolio, such as, photos, videos, youtube & vimeo videos, soundclud or mixclound sound files. AIT club has been in business for more than 8 years and their products and customer support are on really high level! Consider visiting product page to see more details about theme, submit pre-sale question or visit live demo version of widescreen theme. Make sure you follow the tips for creating outstanding portfolio in 2016! Once you get your portfolio done, you definitely want to be up to date with your online presence. Provolio is very creative solution for your future portfolio websites with bunch of different options and variations. 9 different creative portfolio variations will give you an amazing choice for your website. You might find it very hard to choose between them because they’re all really cool. There also other pre-designed things, such as, 8+ portolio item pages, 4+ menu types, 12+ page variations and 3 blog types. There are 3 premium plugins included for FREE. They will save you $79, how cool is that? Revolution slider, essential grid and visual composer are truly useful plugins. With visual composer you can create layouts with just couple of clicks. Simply, create columns, rows and drag & drop elements inside them. No coding skills needed. With just 1 click you can import data content which will set all default designs from demo version! Then you just need to edit and change for your content. Provolio theme comes with bunch of other features, such as, navigation style options, responsivity, easy typography, custom post formats, 1 – click updates, translations ready, RTL, etc. Provolio is woocommerce compatible what means that you can easily turn your portfolio into ecommerce store and sell your products. If you are looking for trendy portfolio you should definitely consider visiting live demo and checking what this theme can offer! Grafik is professional portfolio wp theme for designers, architects, freelancers, artists and other types of individual enterpreuners or agencies. With grafik you can easily create your portfolio without any coding skills. It comes with bunch of pre-designed layouts which are highly professional and will definitely meet your needs and requirements. Template’s author is one of the elite sellers on themeforest with tons of experience in customer support. Feel free to take advantage of it and contact them with any issue or idea for upcoming update. You can also post pre-sale question about anything before you make purchase decision. Grafik comes with tons of features, such as, powerful admin, 1 click demo import, case study examples, select core plugin, image animations, image/video sliders, fullscreen menu, different header styles, parallax effects etc. Template is fully responsive, mobile friendly and compatible with any type of web browser. Grafik can present your products or service on really high level and bring you alot new customers. Make sure you put the best work out there and promote in the best way. Grafik is definitely for professionals and it’s great tool for increasing your sales. Visit live demo and experience user experience to have exact idea what you can achieve with grafik! William is another impressive wordpress portfolio theme which comes with very creative and minimalist design. You can’t really compare it with any other template in terms of design. William is suitable for agencies and freelancers in art, design, graphic or photography industry. If you would like to look modern and trendy, show off the quality and impress your visitors, this template can do it for you. Stick with creativity and you’re half way there. Let’s see what features you can find included in the package. William comes with bunch, such as, 9 pre-designed portfolio layouts, 650+ fonts, 350+ fontawesome icons, retina ready, framework bootstrap 3.3, 50+ shortcodes, etc. Template is fully supported with premium services, such as, detailed online documentation, lifetime support access to author’s forum and regular theme updates. William theme is easy to setup and you can get your portfolio website done in couple of hours! No coding skills required. Make sure you keep best pieces of your work to stand out and represent you on homepage. Setup an easy way to get to know you, your business and to contact you. You website can bring you plenty of leads if you play yout cards right. Keep your portfolio updated and don’t forget to run blog page. All these tips are essential for successful website nowadays. Check article from the Chief Designer of Behance on 6 steps to create a knockout online portfolio. Use the best tools available and learn from the best and be ready for 2017! Another creative portfolio wordpress theme with simple & clean design. Template has been inspired by famous national geographic branding. It’s ideal for agencies, startups or freelancers. Exa comes with bunch of amazing features, such as, SEO optimization, full responsivity, SASS CSS ready files, bootstrap 3, live customizer, 4 different mobile menus, different header options, dynamic grid proportions etc. Template is easy to install, just follow documentation, import XML demo files, use support and update your theme when needed! You will find building your portfolio with Exa is quite easy and you don’t need any coding skills. Focus on first impression, show off your best work in the most attracting way as you can and your visitors will follow and like your brand. Make sure items in portfolio are not too different an confusing, make it smooth and keep only few colors appearing. Pitch template is very universal solution for website and it comes with bunch of pre-designed templates. One of them is amazing solution for portfolio websites which you can fit for freelancers or agency showcase. As you can see on picture above it’s definitely impressive way how to showcase your products or services. You can easily upgrade you website portfolio to an eshop by installing woocommerce plugin which is fully compatible with Pitch. To setup product pages, shopping cart or checkout page is very easy and there no coding skills required. Everything is well documented and in case you get lost, you can easily contact author on support forum and submit your ticket. What else? Template is fully responsive and ready to be loaded on any type of device via any internet browser. If you are looking for professional portfolio solution which looks creative and trendy, Pitch is what you’re looking for! It’s been out for only few days but it’s rocking themeforest since day one! Themeforest is the biggest wordpress marketplace and if the theme gets to section “popular items” you can be 100% sure that is great product and amazing developing team behind it! Check out some great tips on how to build killer portfolio website. Impressive and unique portfolio wordpress theme by aitthemes.club can be used for any type of showcase. Templates fits photographers, artists, web designers, graphic designers, fashion designers etc. You can also add woocommerce plugin and create fully functional shop. Template is fully responsive and mobile friendly. You can load it on any device, platform or web browser. Template’s admin is multilingual and that means you can have your website in any language or multiply languages. Currently, you can choose from 18 different languages. Just imagine giving it to your client in the end of the project in their own language. There are few pre-designed homepage variants, apart from you can see above. They are truly professional and make template very flexible. It supports different types of media elements, such as, youtube videos, vimeo videos, mix cloud music or soundcloud music files. How cool is that, right? AitThemes guys has years of experience with providing high quality wordpress themes and service! You can’t go wrong with their themes and you should definitely consider membership options. Taka few minutes and checkout live preview of the template and test all the features by yourself. Make sure you pick the best work for your portfolio showcase, which will impress your visitors the most. Having PRO looking portfolio is essential for almost every business nowadays. Wave is brand new portfolio wordpress theme from themeforest! It’s super creative and modern looking template for freelancers, agencies and all type of digital businesses. Wave comes with couple of premium plugins, revolution slider and visual composer. Both plugin are very handy and they save you $53. With visual composer you get build layouts of your pages very easily, it will save you plenty of time. Template is fully responsive, mobile friendly and it compatible with all web browsers. Wave also comes with amazing masonry portfolio grids which will help you rock with your portfolio. Your products will stand out! With wave you can also take advantage animated hero backgrounds which are very impressive and improve user experience a lot. Wave comes also in joomla version and html version! Template comes with full support, documentation with tutorials and FREE regular updates. If you creative person looking for best template for your portfolio, you should definitely consider wave and give it at least a try. Click button above and check out live demo version! CRE8OR is one of the few portfolio wordpress theme from teslathemes marketplace! It’s very modern and professional looking. It comes with minimalistic design with focus on portfolio items! You can use it for agency, studio or freelancer websites to show off and impress with your products, photos, videos or projects. With CRE8OR you can choose from 5 different single portfolio item layouts which looks super stunning. You can notice cool animation which is pretty smooth. CRE8OR comes also with bunch of other features, such as, sticky sidebar, optimized load speed, instagram feed, 100% responsivity, icon fonts, w3c validation, ajax navigation, post formats etc. Visual composer and revolution sliders are premium plugins which come for FREE and save you almost $50. Teslathemes products are becoming more popular and membership with them as well. You can currently get 46 template for only $59. How cool is that, right? JOHN is another great theme from mojothemes and definitely one of the best portfolio wordpress themes with ecommerce integration. It’s suitable for presenting of your services and products. JOHN comes with very professional and unique portfolio features which helps to promote and grow your business online. It fits different types of businesses, such as, online photo shops, agency portfolios, freelancer portfolios, online shops, photographers and other creative or business related websites. It’s fully responsive and fits any size of the screen or device. John comes with premium features, such as, typography options, off canvas login, custom sidebars options, smooth scrolling, multi post formats, 1 click demo import, TD shortcode manager, gravity forms etc. Template comes also with visual composer which is of the best plugins for setting up layout and filling the content. It’s very easy to use and it saves plenty of time. If you would like to showcase your stuff in outstanding way then JOHN is definitely worth to consider and you should definitely jump on live demo version and see all preview variations. For some inspiration you should also visit gallery of the best portfolio websites on awwwards.com. Are you freelancer or agency looking through portfolio wordpress themes for showcasing of your business? Well, you come to Charm theme which is definitely worth to consider and check live demo. It comes with bunch of features, such as, 100% responsive, fast blazing, easy installation, lightweight, infinite scroll, isotope & masonry layouts, multiply portfolios, 3x blog layouts etc. Using premium wordpress theme for building your online portfolio is definitely good idea. WordPress is search engine friendly, what means that you can gain very good traffic quite soon. It’s also very easy and you don’t need any hard coding skills to get your portfolio website done! Updating of items in portfolio is also very easy and it will save you quite a lot of time. In case you struggle with theme you can still take advantage of FREE support service, online documentation or free updates. Charm is pretty clean portfolio template and that’s what makes your work to stand out and impress! Bionick is personal portfolio wordpress theme for different types of showcase, such as, photographers, illustrators, designers, video creators, architects, graphic designers and other creatives with need to show off skills and gain more clients. Template is supported by visual composer what means that Bionick is super easy and friendly to build. It comes with bunch of extra premium plugins worth of 51 dollars. Visual composer & revolution slider are included in the package for FREE along with documentation, free updates and access to support forum. What else? Bionick is fully responsive and compatible with all devices and major internet browsers. It comes also with few pre-designed pages, such as, 4 home pages, 3 portfolio pages, 4 portfolio detail pages (slider, image, video) and 5 post formats (standart, gallery, video, audio). Bionick runs on REDUX framework which is very reliable. Code of them is very clean and SEO optimized what can really help you with your rankings in search engines. Feel FREE to open live demo and click through all features and subpages. Get ready for your new portfolio! Another amazing portfolio wordpress template for creating an outstanding portfolio website! Ourea allows you to create professional showcase of your work, whether you’re photographer, artist, web designer, graphic designer or illustrator. If you need to impress your visitors and turn them into clients you need to have great online portfolio. Ourea comes with bunch of amazing features, such as, demo content 1 click import, 8 portfolio templates, grid portfolio with 3d ajax, premium plugins for $28, unlimited colors, redux framework etc. You can run your portfolio in onepage or multi page style and everything is 100% responsive. Template was issued by one of the themeforest elite authors and that can ensure you that it comes with TOP support team which will help you with all difficulties! Ourea is SEO optimized and you’ll rank quite easily when you play your cards right! If you wanna go internationally, you can easily translate your portfolio website with WPML. Click live demo and check out more.! Onion is one of the newest portfolio wordpress themes on themeforest.net with very unique and simple layout. Template is ideal for creative agency, studio or freelancer portfolio. Fullscreen home page with your latest or best projects placed in a scrolling frame. Each project is designed so that it occupies the entire screen of the browser. Amazing scrolling effect will impress your visitors and roll on other projects! You can choose from 4 different portfolio page layouts and show off your products in detail. Onion blogging options give you a lot of creativity and smooth experience for readers. You can choose from 6 different demo layouts which are already pre-designed for you. If you jump on live demo you can preview them all. Template is SEO and W3C optimized and that’s great advantage for ranking in search engines. Portfolio options are very powerful, you can use vertical scrolling on homepage, 4 different layouts, animated portfolio page with slidefrombottom effect, next & previous options between items etc. Onion is complete solution for portfolio website which is really easy to customize and setup. If you are beginner that’s option you should definitely consider. Huntington is clean portfolio wordpress template with grid system layout. It’s fully responsive and retina ready. Suitable for busy designers, photographers, artist and other creatives who wants to showcase their portfolio and be able to update it quickly. Visual composer is the answer to this problem, it’s very friendly and easy to use. Composer allows you to create your layouts and add content very easily and that will save you quite a lot of time and you can focus on building up your offline portfolio. Huntington comes with other features, such as, CSS3 animations, WP 4.2.2+ ready, index alternative, filterable portfolio, 1 click demo import, project detail page, different homepage layouts, etc. Huntington is definitely one the best portfolios I’ve seen recently and it’s definitely worth more than those $48. I’ve tried it on my phone and tablet and it works just awesome! Go a head and try live demo! Master – onepage portfolio wordpress theme comes with very creative and unique design. With this template you can really step out! Master is 1179 grid based, fully responsive, available only in one page style but very flexible for any type of business. If you’re freelancer or agency which wants to show a bit of creativity and promote in an outstanding way, that’s the template for you! Main features are, clean and pro design, free fonts, easy to customize, elegant icons, bootstrap, etc. If you think this theme is amazing but you won’t be able to build it, you’re wrong! With dedicated support and your online documentation you’ll find it very easy actually. If you need portfolio website but you don’t have funds to hire professional web developers to do the job for you, wordpress and wordpress template are the best choice. Don’t waste time on FREE theme, it will cost more than premium templates, just because “time is money”. Good luck with your portfolio. Another portfolio wordpress theme for amazing show off! It’s quite universal but it fits photographers the BEST. You can use it for any website if you like it. It looks very modern and it will grab attention of your first visitors straight away. Panama is fully responsive and it fits any kind of internet browsing device. It comes with bunch of unique features, such as, peenapo page builder, megamenu, ajax page loading, 5 gallery layouts, filterable portfolio, floating columns portfolio effect, image copyright protection, password protection for galleries etc. You can create all other subpages, such as, about us, service or blog and introduce you agency or yourself. If you are professional photographer and you think you don’t have enough knowledge to build website, you’re wrong. Using wordpress and themes is very easy and when you buy premium theme you have documentation and support ready for you anytime! You don’t have to waste money on wed designer, you can do it by yourself, your website it’s all about your photos and portfolio! Don’t hesitate and show off your work, get your portfolio website out there! Another amazing portfolio wordpress theme is out! Is your agency ready for new look? NINE is very flexible and it can fit many types of websites, such as, restaurant, creative agency, fashion, travel, business, hospital etc. Demo layouts with pre-designed homepage and subpages are ready for all these industries. NINE comes also with bunch of amazing features, such as, visual composer, revolution slider, live customization, one page sections, one click import, custom branding colors, 4 headers, mailchimp support etc. Great portfolio options with filtering help you to showcase your amazing work and present your agency in very creative and appealing way! Different types of sliders give you different option how to catch attention of your audience. Remember, first impression is essential aspect of your website. The picture from live demo is perfect example, it caught my attention for sure. That’s why this template is in this very collection. Don’t forget, if you get stacked while building your portfolio website, you can get help from support forum or your online documentation. All that comes for FREE with template along with regular theme updates. Looking for quality portfolio wordpress theme? Well, you’ve found one! Capri is quite newbie on themeforest but it rocks for sure! What’s more is that capri is not just that, it’s very flexible and you can creating plenty of different types of websites, such as, agency, blog, magazine etc. Capri was released by one of the elite authors on themeforest and it’s definitely high quality stuff! It’s packed with tons and tons of extensions and features, here is list of the best: 12 stunning designs, 2000+ admin options, 1 click demo, woocommerce ready, fully responsive, PSD files ready, 600+ google fonts, 6 icon font packs, professional documentation, animations and much more. Your package comes with FREE updates and support as well. Updating of your portfolio is importing as updating of your wordpress theme! Nowadays, there are bunch of attacks and changes in WP and you should keep you wordpress, theme and plugins always up to date! I hope this template will help you out to build your amazing portfolio and your work will shy in your showcase. Another amazing portfolio wordpress theme for creatives! It’s very innovative idea to present yourself in such unusual way and layout. I’ve really enjoyed trying live version and clicking all the elements. It seems messy but it’s not, I would say it’s very intuitive and it gives much different experience than other portfolio themes. It’s fully responsive and compatible with all browsers and devices. Package is full of great features, such as, theme customizer, css3 animations, font awesome icons, free google fonts, masonry portfolios, team member page and much more. With detailed documentation you’ll be able to setup everything by yourself and get website up and running in couple of days. Support and updates comes for FREE along with PSDs package! That will save you plenty of hours. If you’re looking for great portfolio and showcase that will stand out of crowd, this is your choice! It’s ideal for freelancers and agencies as well! Colors Creative is amazingly professional portfolio wordpress theme ready for your products! If you’re looking for ultimate showcase, that’s the theme for you. It’s best for illustrators, agencies, photographers, freelancers and other creative professionals. It comes with very special set of color options which you definitely never seen before. It comes with couple of special features, such as, automatic color change in navigation bar, navigation bar items, different colors background rotations in header, automatic background color changes when scrolling, grid portfolios, google maps element, etc. You can use also visual composer which is included in the theme. You’ll save quite a lot of time with it and you save 33 bucks. How cool and unique is that? Feel free to try it out by yourself. Seven is one of the newest portfolio wordpress themes of 2017 with amazing layouts and designs for creative agencies or freelancers. Seven is the best solution for illustrators, photographers, graphic designer or other creative people who would like to showcase their portfolio in a stunning way! It’s very easy to build because it comes with amazing drag & drop plugin so called visual composer which is the best WP plugin for creating website layouts and content. No coding skills required, just common knowledge, plus you can benefit from detailed documentation or if you’ll need more help you can contact support forum of the author. You can choose from 8 pre-designed portfolio or showcase layouts for you business or agency. Almost everything is ready for you! You just need to import demo data, change pictures, write your own content, adjust colors and you are ready to go live with your portfolio website! Check it out, it’s one of the most create themes for portfolio out there. Kingpen is creative wordpress theme ready for your portfolio or other type of website! It’s very modern and professional looking design and it fits creative agencies or freelancers profile. You can switch between multi-page or onepage style! It runs on redux framework and it’s fully responsive and retina ready. You can save time with using 1 click demo content and taking advantage of support and documentation. Kingpen comes with unique features, such as, custom scrollbar, powerful admin, wmpl or video tutorials. If your business is unique and you are looking for different way how to present it, kingpen is your creative solution. If you want your portfolio to stand out from the crowd, convert and bring new clients, kingpen is your tool! Klou is very creative WordPress theme portfolio, best for graphic designers and presenting of their creative work! If you’re ready to showcase your amazing portfolio and you’re looking for webpage solution, this is definitely good choice. Klou is very simple template focused manly in one purpose of showcasing great designs. It’s very easy to set up and very affordable since cssigniter team offeres amazing prices on products in their portfolio. Good thing is that template has been recently updated and new version is friendly with every imaginable device. MiAgency is another portfolio wordpress theme standing out of crowd with it’s unique design! Combination of branding, creativity and minimalism seems like a winning recipe. You can choose from 6 different demos ready for your portfolio website. It’s very easy to use and customize in wordpress and building of your portfolio web will be matter of few hours. MiAgency is fully responsive, HTML5 ready, WPML ready, bootstrap 3.1 based, W3C valid and well documented. You can use 3 types of portfolio, masonry grid, masonry 3 column and single full width. MiAgency is suitable for bloggers, fashion & graphic designers, Agencies, Studios or Photographers. Feel free to browse live demo version and try if that’s what you are looking for. 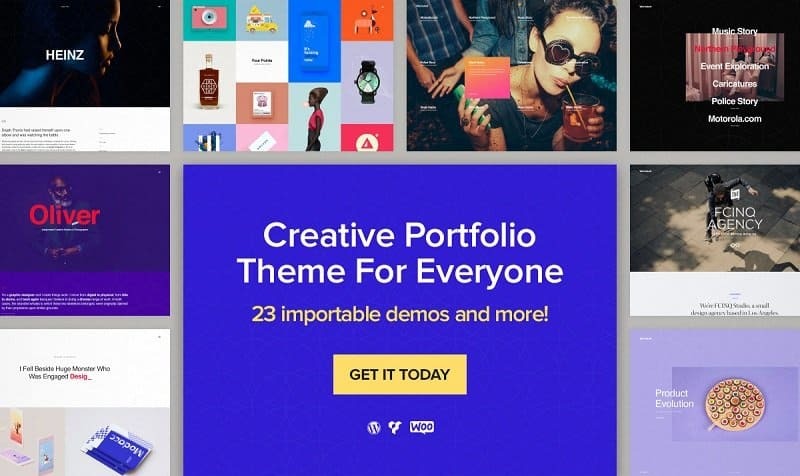 SUPERME is creative portfolio template for WordPress! Airtheme designed and released this theme almost one year ago in HTML and after couple of months they released wordpress version. Template fits exact needs for quality & professional showcase for photographers, designers and also bloggers with it’s phenomenal blog options. It’s very easy to customize and admin dashboard comes with 75+ extra options. Theme has super clean code and it comes and it’s 100% responsive. You can save a lot of time by importing the demo content and by following the documentation. In case of any troubles you can contact airtheme team and will help you out. You don’t need any technical skills to get the website done and create your online portfolio. In case you’re interested, HTML version is also available in their portfolio on themeforest. Don’t hesitate, it’s one of the TOP themes for portfolio you can find. Crush is professional portfolio wordpress theme which comes with all features you need for creating high quality website representing your business. It’s very easy to customize and build because it comes with wordpress theme customizer which saves a lot of time! Crush is best for freelancers, bloggers or creative agencies. Theme is responsive and retina ready and what’s best is that you can use it for eshop as well. To install woocommerce and setup shopping cart with your products is question of couple of hours. There is few demos pre-designed for you and if you implement sample data you can easily test them out! Crush comes with great online documentation and resources which will guide you through whole process of developing. In case you’ll get lost or your break something you can contact their dedicated team on their support forum and submit your ticket! If you’re looking for amazing portfolio solution, you’ve just found it! Genio is new & popular WordPress theme portfolio released on themeforest recently. It runs on flatron bootstrap theme with amazing features. It’s best for presentation of your resume or personal portfolio website. Genio is simple to setup and install + it comes with 1-click demo import and that’s huge time saver. It comes with very special feature called lazy loading portfolio. Check out live demo to see how cool and lazy the portfolio is. You can choose from 6 different skins, 4 different homepage layouts and different post formats and layouts. You can embed hire & contact form for your potential clients and get in touch with them. I’ve purchased Genio as well and started portfolio website for my client. I haven’t found any bugs yet and it took me only few hours to get website 80% ready. Highly recommended for portfolio purposes and skills showcase. Yama is one of the best WordPress portfolio themes I’ve seen on themeforest recently. Very clean and professional design speaks for everything. Yama is responsive and retina ready template. It’s very easy to customize because it comes with detailed manual and tutorials. You don’t need any coding or developing skills to build website from Yama. Showcasing of your work and portfolio can happen in couple of hours. Theme comes with professional customer support, clean HTML5, SEO optimization in mind, unbranded theme options, diversified portfolio, isotope portfolio filter and other very unique features which you’ll definitely appreciate and enjoy working with. Click live demo button and discover this beautiful template by yourself. Cufo is professional and creative portfolio wordpress theme from themeforest. It’s full of amazing theme options which will help you to showcase your creativity and work very easily. You can use amazing real time customizer for creating your home page and subpages. Cufo is responsive and retina ready. Different demos are ready to import or you can start creating from the scratch! Author offeres great 24/7 support and online documentation. Cufo is truly unique wordpress theme with tons of features. You’ll not gonna regret because it’s high quality. It’s great future investment because you’ll get free lifetime updates. For full overview and list of features follow live demo + download button and you can see what’s going on by yourself. Papyrus – Personal Portfolio WordPress Themes is on one the most creative wordpress themes I’ve came across on themeforest lately. Your visitors will become your potential clients in just few seconds after they scroll your website! You can fit in your resume everything you can possibly imagine. You’ll rank well in google search because theme is SEO advanced and W3 validate. Latest CSS3 & HTML5 techniques used and visual composer ready! Papyrus is responsive and WMPL ready. Template runs on high quality redux framework. People and visitors appreciate always something different and new on the internet. They always remember sites like Papyrus because it stands out of crowd. Template are used by many people around the world, but there is no way they can find out that more pople are using the same template. I highly recommend having creative portfolio and focus on first impression and play around with branding. MD is one of the best portfolio wordpress themes on market currently suitable for different types of professions. Template is designed more for individuals usage but you can use it for agency portfolio website as well. Metrothemes team put a lot of effort in minimalist & professional look of the theme. MD is not just great from outside but from the inside as well. You can use one / multi page style, parallax sections, custom backgrounds, easy theme options, 8 color skins, isotope portfolio, etc. 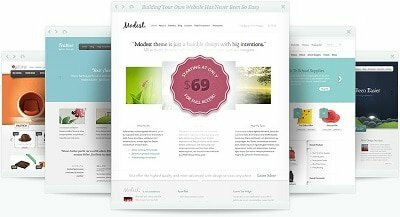 If you are good and you want your visitors to truly fall in love with your work, MD is one of the top portfolio wordpress themes you can pick up! It’ll make your life much more easier and it’ll drive your traffic and new clients very soon. MD is coming with detailed documentation and dedicated support team which will help you to overcome all difficulties with developing part. Metrothemes team is one of the Elite authors on themeforest and their portfolio with templates has been rocking for couple of years. You can’t go wrong with their templates! Folio Zee is very unique and creative portfolio wordpress theme with extraordinary layout and design. It comes with unlimited colors in 3 different concepts of Light, Dark and Grey. With it’s curve design features Folio Zee is one of the most seen themes on Themeforest. On the other side, it’s not only great looking but it’s also very organized and clean coded theme. For building you can use visual composer and get onepage or multipage website ready very quick! Folio Zee fits large corporations but you can also find it very interesting if you’re individual / freelancer. Template comes with trusted redux theme option panel, wpml optimization, one click demo, awesome support and bonus step by step video tutorial. Universe is multipurpose WP Theme with amazing branding showcase. Very modern and creative design makes universe one of the most popular wordpress themes by teslathemes. Check their website it’s full of good stuff and awesome membership deals. Coastline is perfect portfolio solution for designers, artists, graphic designers, illustrators etc. Very easy to build with friendly admin functionality. Coastline is one of the 60+ templates from CSSIGNITER slub which offers amazing memberships and prices. Coastline contains all the important subpages you need for complete website. Showcase, blog, about page, social integration, contact page are all responsive and ready for you to add without programming knowledge. There’s no time for hesitation, this is theme you’ve been looking for! Nitteo is another creative portfolio wordpress theme with very clean and minimalist design inspired by apple and flatty trends! It’s an amazing one page style design by Vojtech Sebo available only for 20 bucks on creative market. It’s very easy to customize and you can set up your web in few hours! Nitteo is fully responsive, parallax friendly, HTML5 & CSS3 ready, PHP/AJAX ready, font awesome icons packed and very well documented. Click live demo button and see yourself, it’s better to try once than to see 100 times! Nitteo comes with regular updates and improvements + with FREE support. Are you ready to get you own portfolio? GetPhoto is perfect wordpress theme for portfolio of creative photographers. If you have amazing photo and talent you should build up your portfolio and showcase your work. Getphoto is full screen template bringing all the important features but put your photos on top of everything! Template also fits artists, designers or even photo content. Getphoto is full of different gallery options and page variations. Masonry, grid and metro layout awe included for you as well. All you need is common PC sense and little bit of courage, but there no coding skills needed what so ever! Are you ready to showcase your creative work? If not check reviews, comments & documentation and you’ll realize that you are ready! Very modern, dynamic and minimal design is first you realize when you open up Ricca portfolio wordpress theme for creatives. Ricca suits both, individuals and agencies. Template is fully responsive and it comes with revolution & layer slider. Ricca is compatible with WPML, Gravity, contact form 7 etc. For easy building of content and skeleton of your website you can use 1-click demo. If you’re looking for moder portfolio template, Ricca is great choice! It’s very well documented and team respond very quick to all the question on support forum. As bonus they came with password protected galleries, so only your clients who will get access can crawl your awesome work. Story is not the newest template in these collection! It’s been on the market for almost 1 year and it’s rocking since then. Story is creative portfolio wordpress theme with more than 5000 sales. You can’t disagree with that! It’s definitely one of the best on themeforest and it comes with tons of features. Templates on the market for such a long time goes through a lot of updates and fixes and after some time you can be really sure that you’re spending money for high quality & updated wordpress theme. The pricing of story is a little bit higher but you can use it for various types of websites, such as, corporate, eshop, agency, personal presentation etc. If these proofs of quality are not enough for you, take a look on live demo version and play around! Pond is creative portfolio wordpress themes ready to represent your products and services. It comes with very minimal and professional design. Pond is responsive & retina ready anytime and you can use cool features, such as, viewport border, split sections, overlay header style, unique pagination, parallax & video background, easy demo importer page builder, full typography control, free support & updates. What else would you need for creating of your website? Pond is great package for few bucks which will cover all you needs and you can build your website with no coding skills at all. Mee is interesting portfolio wordpress theme with great value included. You get HTML template + visual composer worth of $42 with the theme for $43, how cool is that right? Template comes with very clean layout and design with amazing option to include your full resume and showcase your portfolio. It’s best for individual presentation of job skills or educational experience. Mee is SEO friendly & W3C validate what means that after you’ll lunch your web the search engines will rank your web very smoothly. That’s the best way how to bring organic attention to your website. Mee is very professional mix of resume & portfolio wordpress theme, see live demo if that’s what you are looking for. Honcho is pro onepage/multipage portfolio wordpress theme with amazing creative design and layout. It’s responsive, retina ready and running on bootstrap 3. You can choose from 4 various version and work with premium CUBE portfolio plugin! There are great effects & animations running on CSS3 and HTML5. Building of this theme is very easy because there is great video documentation included. In header you can have 4 different block types, such as, image, slider, html5 & youtube video or colour fade. 439 retina icons are ready for you along with milestones counter, pie charts, ajax contact form, google fonts and couple of extra elements. Max Scope is creative portfolio wordpress theme with very unique design usable also for blog which fits any kind of business. It comes with popular features, such as, drag & drop builder, revolution slider, different post types, video + audio support, unlimited color options etc. Max Scope is SEO optimized and has very clean code with 100% jQuery! User experience is priority of this template and it is spectacular indeed. The layout of theme is very unique and there also few different home pages pre-designed. I’m sure you’ll be able to pick one and follow it during developing and designing of your website. Max Scope is definitely bit asset to this collection and shows how to think of of box when you’re designing. By the way, template has very detailed and extensive documentation which will help you overcome any difficulties during development. Click live demo and enjoy this masterpiece. Richard is very advanced blog & portfolio wordpress theme for creative businesses. With it’s modern look full of trendy graphics and features you can literally rock on the internet. Blogging is very important in terms of SEO and branding and Richard is one of the best themes for that. You can run portfolio, great blog and shop on one website and achieve amazing visitors engaging. It’s full of great features, such as, drag & drop page builder, revolution slider, multiply slideslows, video and audio support, jQuery 100%, advanced typography options and other cool features. Check the live dome and see yourself, not just homepage is breathtaking. Xavier is very unique and creative portfolio wordpress themes! Very new & popular on themeforest.net. Xavier is based on creative simple design suitable for agencies, portfolio, blog, business websites. There are bunch of different layouts and pre-designed styles you can use! It’s ready for newest wordpress 4.1. version, visual composer included, multiply post types, custom widgets, portfolio styles etc. What’s great is that free dome installation will save you time and along with detailed documentation and dedicated support you’ll get your portfolio website up in couple of hours! Are you ready to do this? What portfolio do you prefer? Diamond portfolio or square portfolio? I guess there is no time for hesitation! Flancer is very original and unique wordpress theme suitable for portfolio wordpress websites representing freelancers or agencies. Best for presenting of creative work and designs. It comes with great features and couple of premium plugins & sliders included, such as, page builder, revolutions slider, HTML5 files. All that together will help you to save $50 and that’s great deal i guess. Flancer has all modern features you need for running your web! See yourself and check live demo! Enjoy. Stunning wordpress template by elegant themes club! All you need for portfolio is there, just collect your work and get ready to go online with your business. Origin will get you there within couple of hours and it will be fun, trust me! Lenze is professional & creative portfolio wordpress themes for photographers! You can use 3 different homepage styles which are all truly amazing, you can choose from fullwidth, box style and fullscreen layout. Lenze uses the newest CSS3. jQuery, HTML5 technologies and has audio & video support. Template is responsive and as bonus grid items in portfolio are responsive and look cool on the tablets and mobile devices. For building of website you can use very easy drag & drop plugin which will save hours of your time. Your high quality photo will perfectly fit into this theme and your business will rock online again. Buran is new portfolio wordpress theme of 2017! Very creative design with focus on branding makes template to look very professional and best for corporate purpose. Great creative elements will help you to become leader in your sector and promote you business in an outstanding way! Visual composer and shortcodes will save you hours of work and you’ll get the website done much earlier than you think. Buran is SEO optimized what means that your website will be ready to rank in google search just couple of days after you launch. Start 2017 with this great template and kick off your creative business! All templates comes with great functionality and FREE updates and support. If you need to showcase your portfolio and looking for easy how build it, WordPress is definitely best choice and using template will save you lots of time, which you can invest then to you work! All these templates are very professional and they will suite a lot of different projects as well and you can always include blog, about me, landing, contact pages to your website. Thanks for sharing these portfolio wordpress themes! They are the best for sure, it’s hard to choose only one for my portfolio. I’ll probably go with the first one. You have done a good list. I want to share with you another theme too. It’s fully responsive & free theme. Great theme list. Here is another awesome portfolio theme. Bizstream Ultra Responsive Multi-Purpose theme. Has just been rebuit for version 4. Great for use as a portfolio theme and multi-purpose theme. Hey, thanks for including my theme, STAG too http://goo.gl/0J8bCF . I really appreciate it! This is quite an impressive list of themes and I have to admit that they`re all top-notch, from the both design and functionality point of views! Btw, does anyone know a good resource to compare and sort out wp themes according to their design, quality and security? Thanks. thank you for your feedback Liliia. I don’t know any good resource which publishing this exact comparison. Be aware that the Notio wordpress theme is pretty much unusable on a mobile device – the lettering is virtually unreadable and if you find that out after you purchase it you won’t get a refund. If you purchase any theme from Envato you may not get a refund so research carefully. Wow, what a great portfolio actually this is one of the most creative one I’ve ever seen. Great job for this. thank you.. we try too keep it up to date and only high quality portfolio themes. I think Collective – https://themeforest.net/item/collective-minimal-wordpress-theme/16956348 undoubtly should be part of this listing. Thanks for suggesting here such a nice collection of WordPress themes. Hi Viktor, this a great list! Thanks for collecting it. I know you probably get asked to review a ton of themes, so I’ll keep this short. I’m building a portfolio theme solely made for designers, and I would love to get your feedback .. Mind if I send you the link? Hi, nice list of portfolio themes. Here you can include this theme in your list https://themebon.com/noor/ its damn good free multipurpose theme. Would you like to add new portfolio theme in your collection?